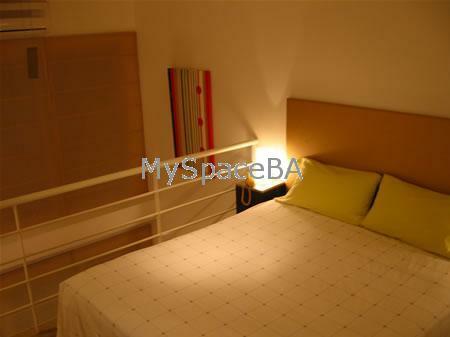 Beautifull and Luminous Duplex apartment. This homely and ample apartment is located in one of the most beautiful neighborhood, Las Cañitas. In the lower level you will find the living area with sofas, a coffee table, totally furnished. The dinning area has a modern table for two, it also has large windows with a way out to the balcony. The kitchen is open and is fully equipped with fridge and freezer, microwave, coffee machine, utensils. In the upper level you will find the quiet and nice decorated bedroom with a queen size bed, a wide placard, air conditioner and bathroom ensuite totally complete with bathtub and shower. This apartment is a great option for you to stay in a quiet place in Buenos Aires but near the most cultural and nightlife areas of the city. Warm Individual water, Individual Heating, Air conditioning, Freezer, Microwave, Air Extractor, Coffee Machine, TV for cable, Fridge, Wi Fi Internet, Utensils, Towels and sheets. Swimming pool and solarium in the terrace of the building, Doorman, Elevators. Bus routes, Parks, Restaurants, Bars, squares, Banks, Residential area, Commercial area. Nightlife area, Hipodrome. Polo Field. Included: All the services are paid by the owner.